Now, hauling becomes much easier in this pre-rigged system utilizing 8 sheaves that turn on sealed ball bearings. The lower quad sheave pulley is mated to the upper, quad sheaved, remotely triggered retractable brake. 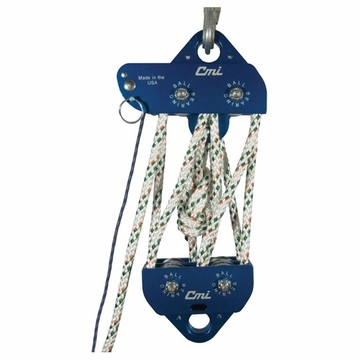 The cam can be locked in the open position to allow freedom of movement up and down or it can be closed so that the user can pull the load and simply let go of the rope, stopping the load in the current position. 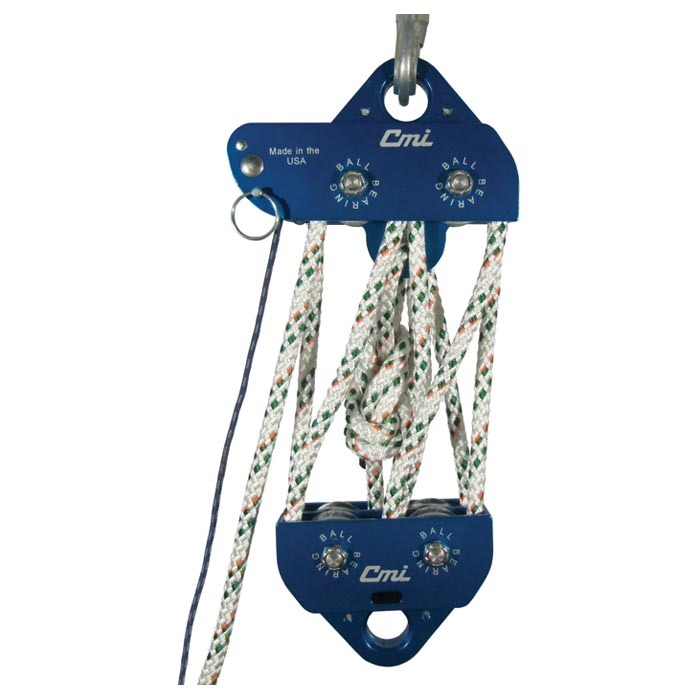 Upper pulley: MBS (pounds): 11,000. Rope cap (inches): 3/8". Sideplates: AA. Sheave: 1 1/2" aluminum. Mechanics: ball bearing. Axles: stainless steel. Size (inches): 5 1/2" x 4 1/4". Weight: 1.20 lbs. Lower pulley: MBS (pounds): 11,000. Rope cap (inches): 3/8". Sideplates: AA. Sheave: 1 1/2" aluminum. Mechanics: ball bearing. Axles: stainless steel. Size (inches): 4 1/4" x 3 1/4". Weight: 1.05 lbs.